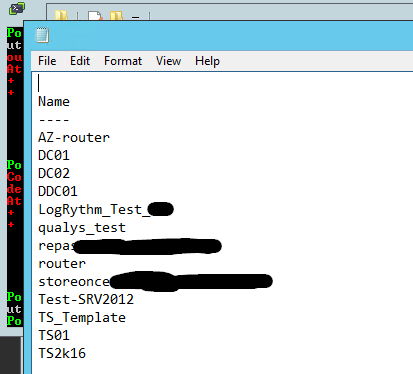 First of all, we have to start profiling the VM’s that we want to protect with Azure ASR. The tool connects to the vCenter server (or ESX) to collect performance data. 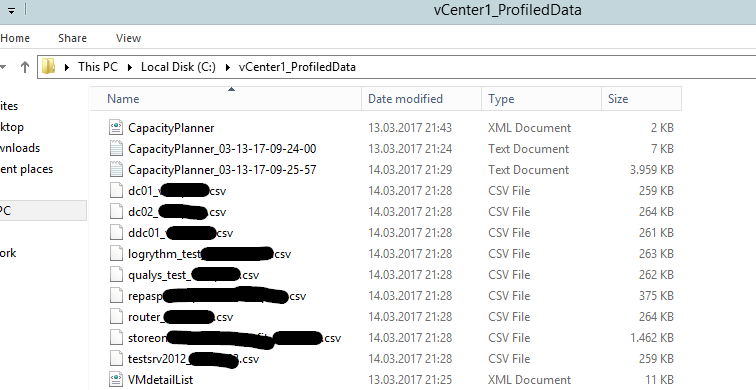 There is no performance impact on the VM’s because the performance data of the vCenter is taken and no data from inside the VM. The tool basically queries every 15 minutes the vCenter to get the performance data. You should get a list like this. I deleted the not needed VM’s from the Textfile and saved the changes. A complete list of all switches can be seen here. If you see following output in powershell you are all right. 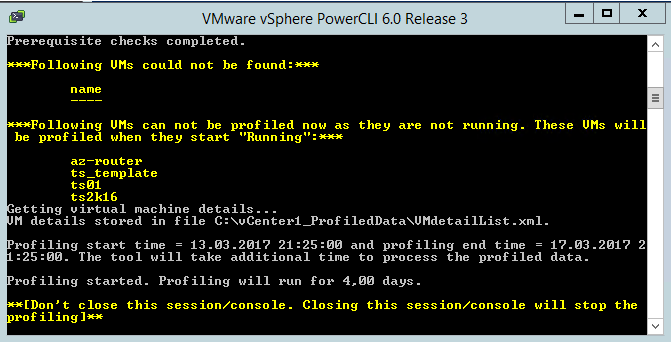 In my case, there are some VM’s not running and therefore a warning is displayed because the tool can obviously not collect performance data. The report is named as “DeploymentPlannerReport” and can be opened with Excel. What we can see from the Excel Report is basically the number of profiled, compatible and incompatible VM’s. If we click on details, we can get the name of the not compatible VM. In my case a VM’s has a Disk with 10TB VMDK attached. 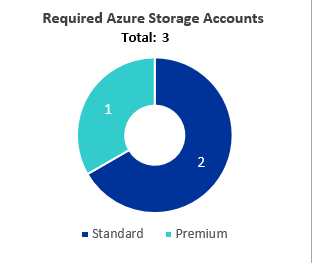 (Azure has a limit of 1TB per disk). I selected in the right corner a desired RPO with 15 minutes. Based on this value the report start calculating the Mbit/s needed. 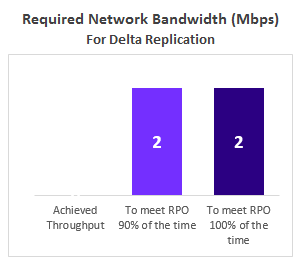 To meet RPO 100 percent of the time: The recommended bandwidth in Mbps to be allocated to meet the desired RPO 100 percent of the time. In my case this is $Null because I have to change the QoS rules and didn’t execute the test acutally. Based on the storage activity the planner recommends the storage accounts needed. I have one VM with heavy storage operations that needs Premium disks (SSD). Very interesting is the recommendation about the local infrastructure. 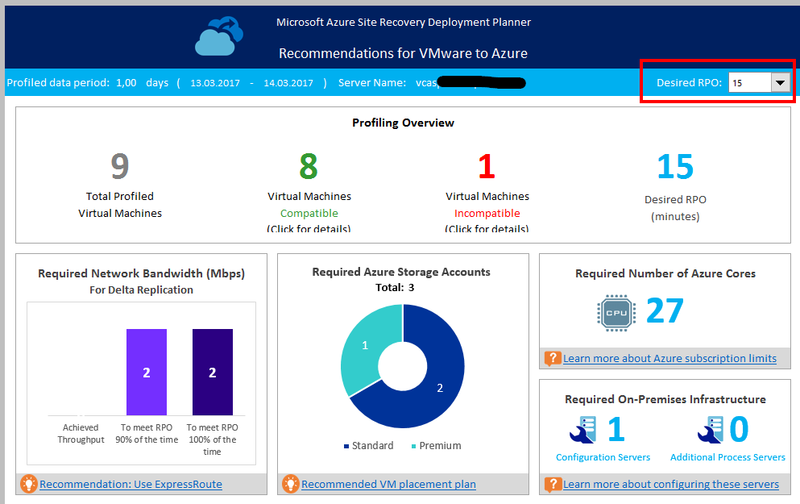 In my case, only one server is needed to replicate the VM’s to Azure. The WhatIf Graph shows what would happen if we decide to use a throughput to meet 90% of the RPO. Actually, I don’t fully understand the sense of the graph. Helpful would be to choose the bandwidth in a combo box or something similar and then see what happens. 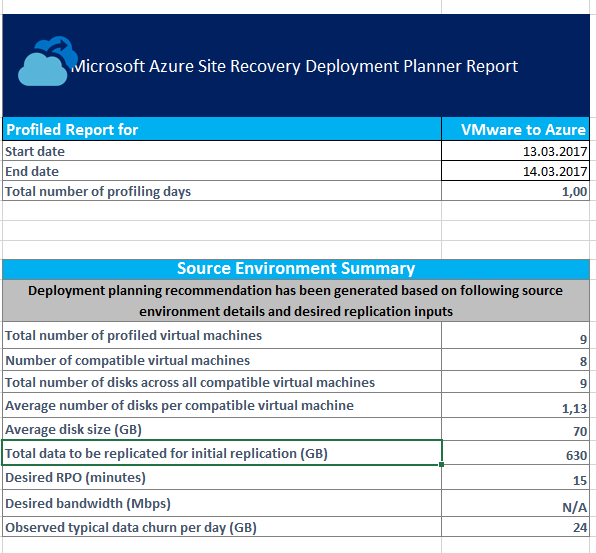 In the Recommended VM batch size for initial replication section, Microsoft shows the recommendation of number of VMs that can be protected in parallel to complete the initial replication within 72 hours with the suggested bandwidth to meet desired RPO 100 percent of the time being set. The value can be changed using the GoalToCompleteIR parameter during report generation. Some things don’t work as expected. But we have to consider that the tool is in public preview, so many changes and improvements are expected. Stay tuned for further updates.